Last night on my way home I got my first puncture. The tyre had an obvious cut in it and was leaking air. I turned the bike over, whipped the tyre off, then the inner tube and proceeded to put a new tube in. A car pulled up behind me and the driver asked if I wanted a lift. It was a colleague from work. I declined and carried on fitting the new tube and refitting the tyre. Once back together I pumped the tyre up and carried on my way. All this in 10 minutes. I arrived at a friends house, where I was having dinner without problem. When I left later in the evening, I noticed my front tyre was flat. With poor light and no spare tube I decided to pump the front tyre up to see if it would hold air as I guessed it must have a slow puncture. It worked and I rode home. 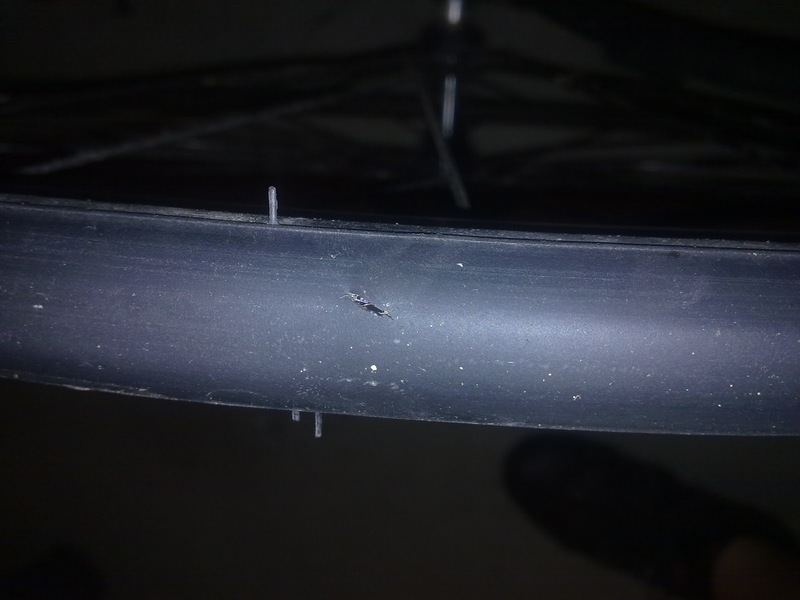 Once home, I inspected the tyre to find about half a dozen minute shards of glass embedded in the tyre. I removed these but as it was late I decided against swapping out the tube. I'll take a closer look at the tyre tonight and make sure there is no glass left in it before replacing the tube. My first ever puncture after 2,265 miles and I get two! Think this tyre might need replacing. Dave - 40 or 50 psi? I'm running 100! John - Thanks for the tip about using glue. I glued the tyre as per your instructions. Hope it will hold.